How is book income calculated on Schedules M-1 and M-3 for Form 1120? The end result reported on Schedule M-1, line 1, should match the amount reported on the financial reporting statements for the corporation’s book income. Where do the amounts come from? Line 2, “Federal income tax per books” – This is the tax calculated by the program and reported on Form 1120, page 3, Schedule J, line 4. The amount can be overridden on the M1 screen. Line 3, “Excess of capital losses over capital gains” – This is the amount of capital losses in excess of capital gains. Corporations are not allowed to take capital losses, unlike an individual who can deduct up to $3,000 per year for capital losses. The amount is determined from Schedule D. Entries are made on the D screen. There is no override for this line. Line 4, “Income subject to tax not recorded on books this year” – Certain credit forms require that the amount of credit be included in other income. The increased income is a tax item only and is not generally included in book income. The increased income amount flows to this line automatically. Additional income items reported for tax purposes, but not included in book income, are entered on the M1 screen, line 4. Line 5b, “Charitable contributions” – Charitable contribution deductions are limited to 10% of taxable income. When the contribution amount exceeds the limitation, the disallowed amount is included on line 5b. Charitable contribution deduction limitation calculation is based on entries on the DED screen, and reported on the Wks Contrib (WK_CNTRB in Drake15 and prior), Contribution Limitation/Carryover Worksheet, line 1E. There is no override for this line. Line 5c, “Travel and entertainment” – Meals and entertainment limitations are carried from amounts entered on the DED screen. Line 7, “Tax-exempt interest” – This includes interest, such as interest received on state or local bonds, and is excluded from gross income. The amount is entered on the INC screen. Line 7 – “Income reported on the corporation’s books for the year but excluded on this tax return” includes life insurance proceeds and gains on certain installment sales. Amounts entered on the M1 screen, line 7, “Other” adjust those amounts carried from the K1P screen, line 18, code B. Line 8b, “Charitable contributions” – Charitable contribution deductions are limited to 10% of taxable income. When a contribution carryover from a prior year is allowed as a deduction on the current-year return, the allowed amount is included on line 8b. The current-year charitable contribution deduction allowed calculation is based on entries on the DED screen, and the LOSS screen, “Contribution Carryovers,” and is reported on the Wks Contrib, Contribution Limitation/Carryover Worksheet, lines 2(a-e)B and 5(a-o)B. There is no override for this line. Line 8 – “Deductions allowed on the return and not charged against book income,” other than depreciation, charitable contributions, and amortization adjustments, are entered directly on the M1 screen, line 8, “Other.” No amounts are carried to this line automatically. Schedule M-3 is required when the corporation’s total assets at the end of the year are $10 million or more. The calculation for Schedule M-3 is done in reverse from the form itself. 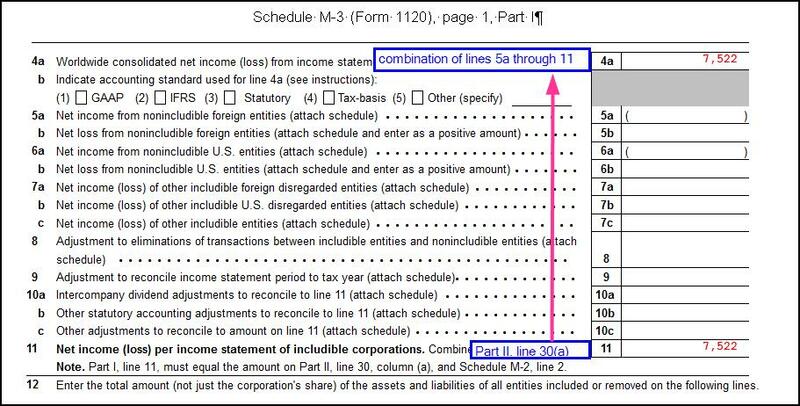 The first step in the calculation is the equalization of the taxable income reported on Schedule M-3, Part II, line 30, column (d), which must match Form 1120, page 1, line 28. Until that amount is correct, the book income reported on Schedule M-3, Part I, line 4a, will be wrong. The end result reported on Schedule M-3, Part I, line 4a, should match the net income (loss) amount reported on the corporation’s worldwide consolidated net income statement. Article has been viewed 60K times.